Somewhere out there I know someone has a ruffly pillow with cursive stitches informing readers that "friends are the family you choose." While I don't have much by way of embroidery skills, boy do I have people who fit that bill. Since I was a kid, I have been blessed with people who aren't related by blood or marriage, but would stand beside me, behind me, and in front of me at the drop of a hat. 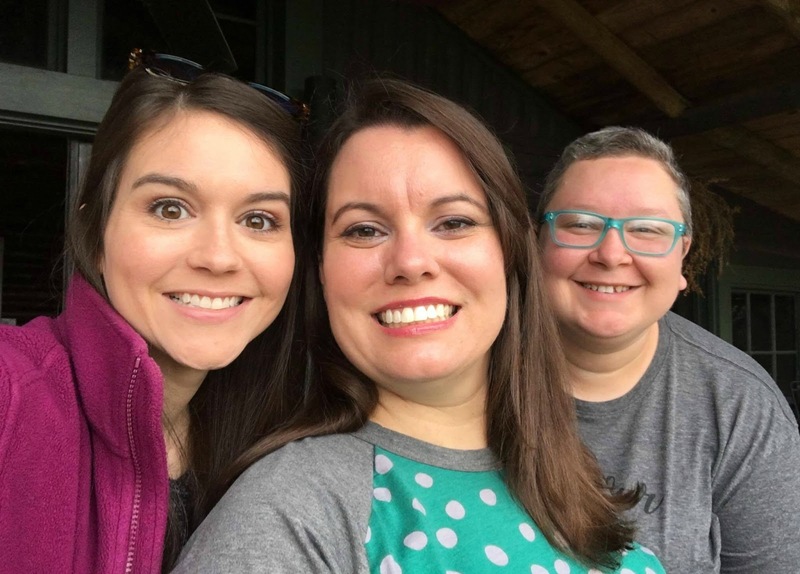 These people become harder to find, but thanks to the connectivity of the Arkansas Women Bloggers, I have two more family members. I have only known Karen and Alicia for a few years, but the outpouring of support they have shown in the hard times and the hilarity we share in the good place them high on my list. Last Friday we pointed Karen's minivan in the direction of Hot Springs and burned rubber. This was our second girls' trip to the Spa City, so I think it's safe to call it an annual event. We all live in different towns, so our face-to-face time is limited. That's why we make the most of what we get. We use this mid-February trip to honestly do whatever we feel like... because we can. This year that meant wandering up and down Bathhouse Row and spending more money than we should have. We also had to eat a cupcake after taking a classic Duck ride through town and hearing all sorts of touristy tidbits we mostly already knew. We lounged in our cabin rental for a while, then headed back downtown to enjoy a chilly evening of live music on the patio at Rolando's. Don't you worry, though, those margaritas warmed us right up. Our evening of debauchery ended at the Oaklawn slot machines. You might remember my first trip, where I decided I was the luckiest girl in Hot Springs. While this round did see me being up 50 bucks at one point, we walked out of there with zero of the dollars with which we began. You might say this curbed our over-shopping. After our wait-an-hour-because-it's-that-delicious breakfast at The Pancake Shop, we parted ways a little early because my family is going through a rough time. Rather than be bummed to cut it short, Karen and Alicia happily pointed that minivan the other direction and drove me completely out of the way to North Little Rock. Like I said, not only are these girls sitting on go when it comes to fun, they show their truest colors when I need them most. The same goes for all of the people my husband and I are lucky to call friends. We know adult friendships are a little different because of life and work and kids, but we pick up right where we left off. Thanks to all who have reached out to us during this hard time. You have no idea how much your friendship means to us. Without going into detail, my family would appreciate your prayers of peace and comfort. Happy Thursday, y'all. Life gets in the way, but today is the perfect opportunity to reconnect with your friends/family. Give them a call, why don't you? PS! For those of you always looking for new books to add to your list, you will love Karen's blog. She is a book reviewer and posts her thoughts a few times a week. I bet she could add to your wish list. Find her at Ting's Mom Books. Also, any dog lovers out there should go ahead and add her newest blog to your reader, too. She recently got a cute little Jack Russell pup and she's sharing these adventures from his point of view. See what I'm talking about at Dak the Jack. As for Alicia, her blog is all things crafty, food, and garden. She's a lifestyle blogger who shares all of her hobbies and gives you ideas to try, as well. Click and see what Simple Words By A has to offer.